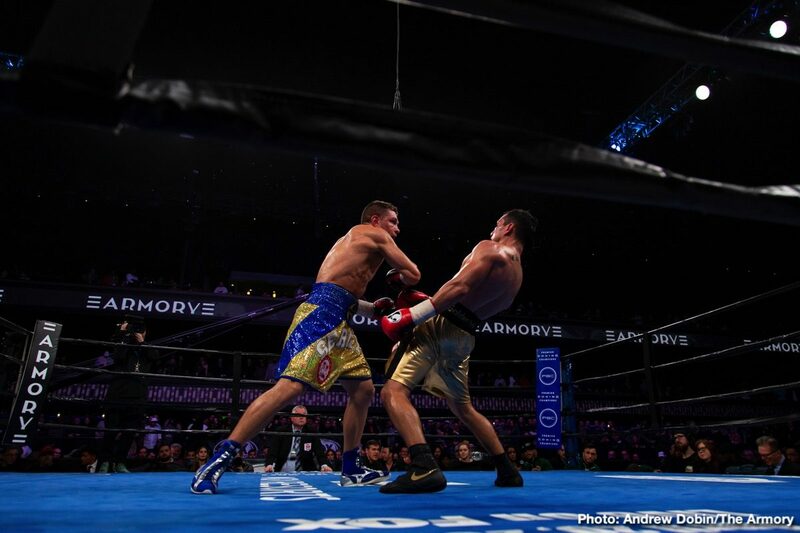 Sergiy Derevyanchenko (13-1, 10 KOs) beat Jack Culcay (25-4, 13 KOs) by a 12 round unanimous decision. This was an IBF middleweight title eliminator. The scores were 116-112, 116-112, and 115-113. Derevyanchenko looked good in landing a lot of hard shots to the head of Culcay in the first nine rounds. Culcay came roaring back in rounds 9 through 12 to get back into the fight, but he still wound up losing 8 rounds to 4 on the scorecards of two of the judges. Those scores were a little on the wide side. Boxing 247 had Derevyanchenko winning by points at 115-113. He deserved the win, but it was close, very close. Derevyanchenko’s stamina problems is what allowed Culcay to get back into the fight. This is exactly what happened in Derevyanchenko’s previous fight against Daniel Jacobs last year. Derevyanchenko fought well in that fight, struggled down the stretch when he got tired, and Jacobs took over the fight to win a close 12 round split decision. The headliner fight between former IBF super middleweight champion Caleb Truax (30-4-2, 19 KOs) and Peter “Kid Chocolate” Quillin (34-1-1, 23 KOs) ended in a no decision in an IBF 168 lb title eliminator on Saturday night at the Armory in Minneapolis, Minnesota. The 35-year-old Truax accidentally clashed heads with Quillin in round 2, which opened up a big cut over Caleb’s right eye. With as much blood that was leaking from the cut, there was no way for Truax’s corner to stop the blood flow to have the fight continue without putting their fighter at risk. The ringside doctor made the call to stop the fight. Since the fight didn’t go the allotted amount of rounds for it to be an official fight, it was ruled a no decision. This could mean that a rematch will take place between Quillin, 35, and Truax, and the two former champions will be right back where they started from, trying to win the IBF title eliminator to become a mandatory for champion Caleb Plant. in the meantime, Plant will continue to make voluntary defenses until a mandatory is determined, and the fight ordered by the International Boxing Federation. Quillin was getting the better of Truax at the time the fight was stopped due to the cut. However, there was still a long ways to go, and there’s no telling who would have won that fight. With Truax’s punching power, he might have eventually caught up to Quillin and knocked him out at some point in the fight. The fight for Quillin was just his third in the last four years. He’s not been very busy with his career. It’s unclear why the IBF had Truax fight Quillin a more active super middleweight. It would be nice if Quillin and Truax fought someone else before they meet up again in an IBF title eliminator. Seeing them both back in their together might make some boxing fans reluctant to tune in to see the fight if they see it ending in another cut from a clash of head. The ending of their fight was predictable from earliest moments of the contest, as they were holding too much, and coming together in a way that made it seem obvious that one of them was going to wind up being badly cut.